As Mary Hightower slumbers in a glass coffin waiting to be reborn back into Everlost, her allies and henchmen begin to carry out her terrible mission. Mary’s army is joined by a newcomer: Jix, a spy for the Mayan King of Everlost. A furjacker who skinjacks great cats, Jix has his own agenda. Meanwhile, Mikey McGill desperately tries to rescue Allie the Outcast. At his side is Nick the “Chocolate Ogre”, who has become pure chocolate and hardly remembers himself at all. Mikey encounters a creature that scares even the mighty McGill: a scar wraith, whose touch can extinguish an Afterlight forever. It becomes clear that the outcome will determine not just the fate of Everlost, but the fate of the living world as well. Critically acclaimed author Neal Shusterman brings to a close the trilogy that Kirkus Reviews called “beautiful and imaginative” with this stunning final volume. Enchanted? Listen to more of the Skinjacker trilogy. ©2011 Neal Shusterman (P)2011 Brilliance Audio, Inc.
Neal Shusterman is a master storyteller, period. I couldn't stop listening! Shusterman can set up and play a scene so perfectly that I can listen to it over and over again and find something new each time I hear it. This is a top-notch story that ties up all the loose ends in the trilogy in a way that is very satisfying. I adored the new characters, especially Jix and his king. Mikey's relationship with Allie was sweet, funny and romantic. Milos turns into a tragic character. Mary's character continues to descend into something truly frightening, capable of some truly godawful acts. Jill redeems herself... barely, but enough that I was rooting for her. How does Shusterman do this? How does he take someone you should hate, and make you feel sorry for them? Or happy for them? Or merely understand them despite their bad behavior? Mr. Shusterman, I am in awe. Would you consider the audio edition of Everfound to be better than the print version? Yes, I read everlost in print form, and listened to everwild and everfound (part 2 and 3) on audio.The narrarated book was well read. allowes the book to come to life because he makes the characters real. Loved the different type of plot. I had read the other two books of this series and just had to find out how it all ended. It didn't disappoint. I couldn't put it down until the last word. The ending was unexpected too. But I liked it and would recommend it. Neal Shusterman is one of my favorite authors - but this third and final entry into the Skinjacker Trilogy is a quirky misstep. Shusterman takes a huge leap down the dark rabbit hole of sinister children's fiction. It feels too very sudden, too overwhelming. I felt the abundance of plot lines boxed me into choosing one character to truly invest in and treat the rest as tangents. The decidedly more sinister tone felt like sandpaper at first. However, Nick Podehl's performance made the book very enjoyable for me and recaptured a lot of the tone of the first book (which I read and didn't listen to). If you enjoyed the first two, there's no reason to skip this one, but it is definitely darker than its predecessors. 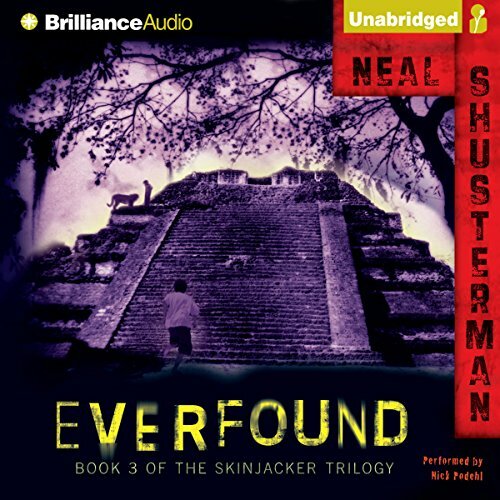 Everfound is the final book in Neal Shusterman's fantastic Skinjacker series. The setting, as in the previous books, is Everlost, where the souls of children who didn't make it into the light after death abide until they're ready to move on, Once the leader of many of the children, Mary Hightower believes she is "saving" the children by preventing them from moving on. As the story opens, she hibernates after her second death in the living world. Her diabolical plans, not only for living children, but the entire living world, are ready to be executed by her enthralled minions. Her enemy Allie is in their clutches. Mary's brother Mikey and her erstwhile love Nick are on a mission to rescue Allie, but are captured by a "scar wraith" who can extinguish their existence with a single touch. Jix, a "furjacker" who can inhabit the bodies of animals, adds his own agenda to the mix. And that's just the beginning of this remarkably inventive and thrilling adventure. It simply took my breath away. The ending is bittersweet but highly satisfying. Nick Podehl does an outstanding job with the voice characterizations. Don't pass this series over if you're not a kid--these books are great for everyone from pre-teen and up! This series was a very imaginative and captivating story and the characters are very well likable and crafted well. If you are a fan of Neal shusterman than you will love how well he can grip you with this tale. It was a very satisfying ending to the series. The voice actor does and amazing job giving these characters a unique voice. I will highly recommend this series!! I am so glad I made it through the first book and trusted reviews on this one. This one picked right back up where we left off and got into the story quick. I quite enjoyed the ending and the journey the series took me on. Every character is wrapped up and I felt at peace about it all. I would definitely recommend this series. Shusterman is my favorite YA novelist, the Unwind dystology in my all-time top 10 of all genres in my repertoire. Shusterman has done it again, this time taking me to an adventurous land filled with magic, beauty, suspense, and excitement. Wonderful plot twists and turns, right up to the very last word, which leaves me fufilled. The characters -- Ally, Mikey, Nick, Milos, Moose, Squirrel, Mary, Jack and Jill, and Jix -- amazing characters who will stay in my literary memory for a long time. I admit Clarence is one of the best developed, most brilliant characters ever! :-) The narrator Nick P is fantastic and my curiosity would be piqued about any book he was narrating. Five stars easily. the last chapter was totally useless ! I guess I will never know how the book ends! !??! If you crave something a little different, a story line that is both unique and exciting, and a book peopled with characters, at once as familiar as old friends and as differnt as any fantastical being imagined, you will enjoy this series. I listened to it over one weekend, needless to say I did not have time to do much else, but it sucked me in and would not let go until I had drunk the last drop of fantasy from the literatry glass. Neal Shusterman has once more demonstrated that he is a master of fantasy for the young an dyoung at heart.